The second largest fast food hamburger chain the United States is headed to your local smartphone. When measured by volume, Burger King is the second largest hamburger fast food chain in the U.S. and it is now expanding even further by moving into the mobile commerce sphere with a new smartphone app. The mobile app will be rolled out to allow food to be purchased in advance on a customer’s smartphone. The goal of this foray into mobile commerce is to try to boost its appeal to younger customers. This mcommerce strategy will be introduced in April and should be rolled out into all of the over 7,000 American Burger King locations within “a few months”, says a company spokesperson, Bryson Thornton. They will likely be adding the option for customers to be able to order their drinks and food ahead of time so that they can pick it up in store. To start, the mobile commerce app will provide customers with coupons that they can redeem for deals. Mobile coupons have become a very successful part of smartphone based marketing and it looks as though the burger chain will be using its app to appeal to consumers from the very start through these discount and deal opportunities. The app will also provide customers with nutrition facts about the various foods that are sold by the chain quick service restaurant. 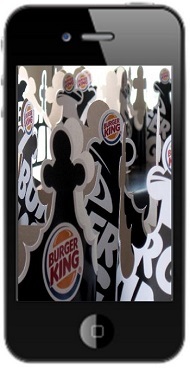 Burger King has also been working its way into the mobile payments arena, as this option has also become increasingly popular among customers in the age group that they are targeting with this mcommerce effort. The app will allow a “virtual card” to be loaded on a customer’s smartphone, within the app. This card can be filled with funds that can then be used for purchasing food and drinks in the same way that a gift card would be utilized. The primary competition of Burger King in the fast food environment, McDonalds, has also been testing a mobile commerce app that would provide its own customers with similar types of options over their smartphones, including information and payments, among other features.